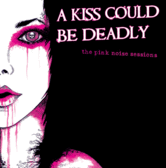 So I was fortunate to fly out to L.A. over last weekend to help on the production of A Kiss Could Be Deadly's first music video. WOW. What an experience. First, the band ROCKS. Second, the entire crew was amazing. Third, I can't wait to see the final product. My role was pretty unique, and more or less made up on the spot. Because we had a smaller crew, I helped out when needed with set work (Alfred Cooney). But mostly I assisted the Director (Chase Kenney), and the Producers. Based on my strong technical background, I was placed incharge of transfering 4-8 GB of data from the Panasonic P2 Cards onto a laptop, and an external drive. Talk about a stressful job. One mistake, and seveal hours of work could be lost. Also I was incharge of playback of both clips, and music for the band to rock to. This including taking thier single, and adding several seconds of beats to the front end. In addition I was in charge of setting up 7 tv's to a dvd player, and 2 tv's to a live feed of the band performing. Finally, my toughest job was bullshitting with the band, and making sure they new what was going on. I want to wish the band the best of luck. If you have a MySpace account check them out. If you contact them, they'll email you all of their tracks. AWESOME!